This purple, lilac, or mauve quartz, you see, was supposed to guard against drunkenness and instill a sober mind. Ancient Greeks and Romans studded their goblets with Amethyst for just that reason. Amethyst carries a 7 on the Mohs scale of hardness. Its purple color is the result of impurities of iron or manganese compounds. A common mineral, Amethyst is found worldwide. Today, we consider it a semi-precious stone, but in various times throughout history, it rivaled Diamonds in worth. The birthstone of February, Amethyst is associated with the Crown Chakra, the center of an individual’s spirituality, enlightenment, and essence. Known as the Bishop’s Stone and worn by Catholic Bishops, Amethyst symbolizes piety, humility, and sincerity. In the Bible, Amethyst was the ninth stone in the High Priest’s breastplate as well as the twelfth stone in the foundation of the New Jerusalem. Ancient Egyptians carved it into heart-shaped amulets for burials. It’s popular in rosaries and prayer beads for its atmosphere of pious calm and mental peace. Amethyst placed under one’s pillow is said to provide pleasant dreams. 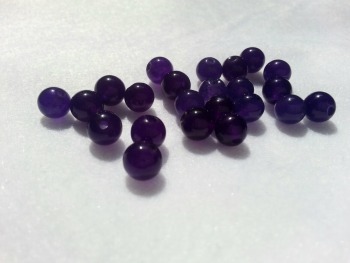 Rubbed on one’s forehead, Amethyst is said to ward off headaches. In fact, Amethyst is said to be an effective healer for people, plants, and animals. The darker shades of Amethyst are said to boost the creative efforts of artists, composers, inventors, poets, and painters. Its calming influence is beneficial for diplomats and business people. Amethyst is a comforting stone, helping those grieving the loss of a loved one to let their sorrow go. And it’s ideal to hold during the time of dying, helping the person release his or her physical body more peacefully. 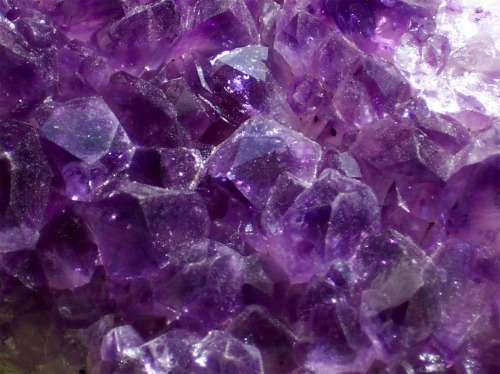 Feng Shui practitioners classify Amethyst as fire energy, Yang in nature. It’s said such energy is passionate, emotional, and active. Amethyst is an excellent stone for meditation, encouraging humility and surrender to a higher power. This entry was posted in Sunday's Gem and tagged amethyst, February birthstone, healing gemstones, properties of amethyst. Bookmark the permalink. Beautiful! Even though it’s purple…I’d give it a wear. On my breastplate, of course. It is kind of appealing in a warrior-sort of way. And I bet it would help in your compositions, too! I love the amethyst crystals! We have a huge amethyst mine not too far from us. Unfortunately it’s closed to the public. It’s right by Four Peaks. Maybe it was at one time, but it’s in a very hard spot to reach. Yeah, scorpions are awful little beasts! I cringe every time I come across one. Gee, they probably could’ve charged admission and everything! Oh, well. And yes, seeing even one scorpion is having seen too many! One of my favorite stone. I have an amethyst butterfly that is very special too me, and purple is one of my top favorite colors. I didn’t know about the healing properties, prone to headaches I might have to try a the amethyst cure. Thanks! I like purple, too, probably because it looks so regal. I read some place that you can buy one of those inexpensive headbands (like at Wal-Mart), place an amethyst on your forehead, and put the band over it to relieve headaches. Personally, I haven’t tried it, but it’s got to be better than popping pills!! Another fascinating and informative gemstone post, Debbie! Anytime I see an Amethyst, I always think of a friend of mine from Florida who LOVED the stone! In fact, she had Amethyst crystals all over her apartment. And she also had MANY pieces of Amethyst jewelry – bracelets, necklaces and rings. It’s so ironic you mentioned that because she often slept with a Amethyst crystle under her pillow at night because she felt that it enhanced her dreams. I think out of all gemstones, Amethyst is probably the most diverse in being useful for so many things. Really enjoying these posts, my friend! Have a super week! Thanks so much for your support and encouragement, Ron! I haven’t tried amethyst under the pillow, but I have read that it enhances dreams. I think my dream world is wacky enough as it is — last night, for example, I dreamed I had a little bird on my shoulder! Wonder where THAT came from, ha?! Have always been intrigued by Amethyist. Thanks for this. Amethyst is a beautiful, mysterious stone, and looks lovely whether set in yellow gold or silver. Best of all, purple goes with just about any other color! Amethyst is the birthstone of four of my five siblings. I’ve always been fascinated with it…perhaps it might be why I love the color purple! Wow — four out of five born in the same month? Your parents must have had lots of fun planning birthday celebrations! At least, there was a nice lull before another gift-giving season (Christmas), right?! They, and so many others, ha!! I just love amethyst. I don’t have any, but I think the color is splendid. There’s a nursery and garden shop here that has every sort of vaguely weird or unusual thing, and they have a huge amethyst geode that must stand four feet tall. I can’t remember what the price tag is, but I looked once, and remember feeling my heart stop. I think it was about equivalent to three months’ rent. That’s interesting, about it fomenting good dreams. I’d think sleeping with a rock under your pillow might cause headaches instead, but perhaps just a small stone is enough to do the trick! My late dad was fascinated by geodes, and I’m sure that huge one you saw would have ranked high on his interest list. Seeing amethyst in its natural state must be quite an experience! You know, I’ve thought the same thing about sleeping on a rock. I imagine when they recommend that, it’s the smaller, flatter stones they’re talking about. One of these days, I’m going to give it a try…just to see what happens…and I’ll be sure to report back, whatever the outcome!! Some of my dreams are so wacky that I’d rather NOT remember them! Still, the idea of going to bed with a headache, sleeping with an amethyst, and waking clear-headed appeals to me. And yes, the deep purple hues always feel so royal to me! I love this one, too! Purple is an easy color to wear (for me, at least), and, while I don’t have Amethyst as my birthstone, I sure do like it. And it’s relatively easy to come by, if you’re not looking for huge and flawless jewelry pieces. It is indeed. I even have a faux amethyst ring and it looks really nice. Amethyst is a great choice all the way around. Another “gem” of a post, Debbie. Thanks for research. I love these and how they relate to energy and chakras and healing. You’re most welcome, Barb — glad you got something out of it.